I got hooked when I went to a Stampin’ Up party in Feb 1996. Through the years, I’ve learned many techniques, but I STILL love to heat emboss using embossing powders. I tend to use vintage-type colors like dark purple, brown, dark green, mustard, and muted colors. It really depends on what I’m creating. I’ve recently gotten into the embossing folders, punches, and die-cuts. Just experiment! I tried a lot of different styles before I figured out what I like to do best. As I used to tell a friend: the only rule in stamping is that there ARE no rules! Don’t be afraid to try something new or if it looks difficult. Just play and have fun! 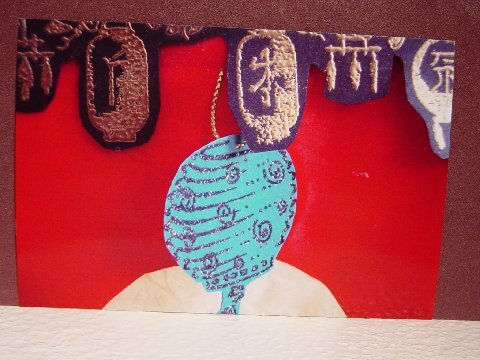 I love the beauty of many Oriental images – especially the photo images and kanji/calligraphy. I have subscribed to RubberStampMadness for many years! I guess it attracts me because of the “quirkiness” of many of the samples. In recent years, I’ve gotten The Stampers Sampler, too. It has gotten away from all of the “cutesy” stuff (I do NOT do cute). No, but I’ve never been brave enough to send any in. But I have had cards featured on the home pages of many of the Yahoo groups I’ve joined, and that is pretty close! I love to read (mysteries and true crime). I’ve been playing handbells in church for about 12 years. I also started playing accordion in 1st grade and saxophone in 6th grade, like to bake, and recently got addicted to Pinterest!! LOL I used to work w/plastic canvas and cross-stitch a lot, but that was before that rubber bug bit me HARD!! When I get a new stamp or stamping toy, or if in a challenge or swap, I like to really think-outside-the-box and put my own spin on my creation–which is why my SU demo always counts on me to NOT follow her example! I took the basics in school: took fibers, jewelry, and yes – basket-weaving classes in college. My mom was an artist, as was her sister, and my aunt’s DD is an art teacher, so I guess I do have a few artistic genes in me. Splitcoast stamping is great, vendors’ sites almost always have wonderful examples, and I’m starting to follow some blogs that interest me. I am a para-professional (the new, fancy name for an aide) in Early Childhood Family Education (absolutely LOVE that job), and also do subbing at a daycare. I’ve also taught the pre-school class in Sunday School for the past 21 years. I live in Red Wing MN, which is an hour south of St. Paul/Minneapolis, on the mighty Mississippi River pretty much all of my life. I just turned 61 last month, but usually tell people that I’m 3 or 4! My DH of almost 34 years is a retired truck driver/refrigeration technician. Our DD, who is 30, lives in Minneapolis and is an ELL (English language learners) teacher in St. Paul. She has also studied and taught in China and absolutely loved it. Our DS, my baby, just turned 26 last week and works in retail. He lives in WI about 8 miles away and works here in Red Wing. They each have a cat, so that’s the closest I may ever have to any grandchildren!! LOL! Red Wing is also very famous for Red Wing Pottery and Red Wing shoes, which is world-wide. I’d be happy to answer any other questions you may have and was thrilled to be a SAM!!! 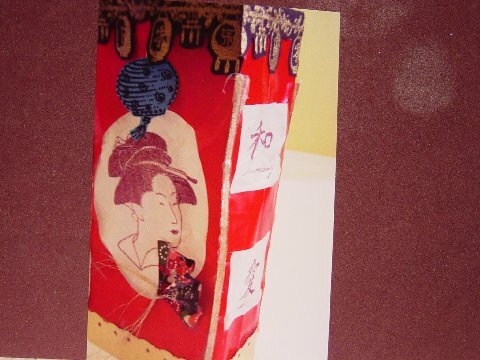 A few years ago at my stamp club, our demo gave everyone a red coffee-bean bag to “re-create”. Most of the others did cute bag-toppers, but not me! I started out by taking the bag apart and cutting off the bottom. 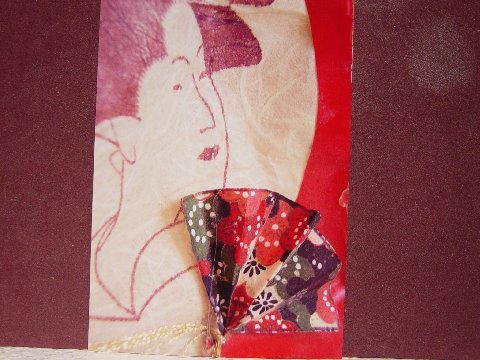 I cut an oval out of the front, stamped a geisha (Gotcha Images) on mulberry paper and glued it inside. I repeatedly stamped and gold-embossed the hanging lantern border (Above the Mark) to make a border around the entire top. 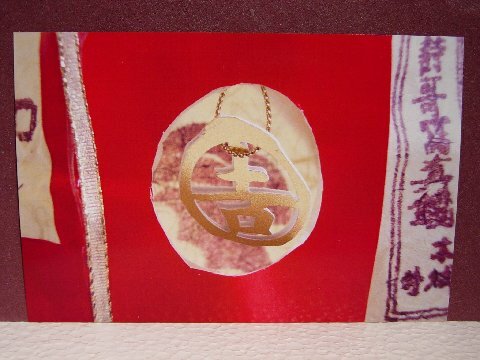 The Kanji images (Stampin’ Up!) and the other images (Hero Arts) are also stamped on the mulberry paper which is the lining inside. I cut a circular hole in the back to hang my Good Luck punched shape. 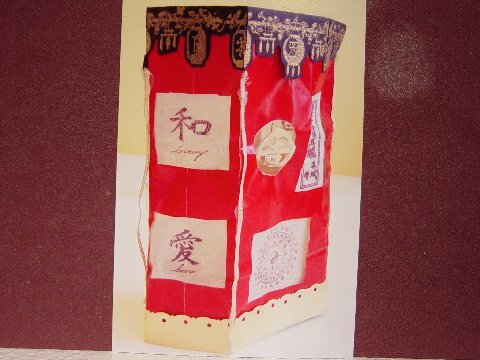 A blue hanging lantern (Hero Arts) is on the front border hung with gold thread. I made a fan out of origami paper, tied the bottom with gold threads. 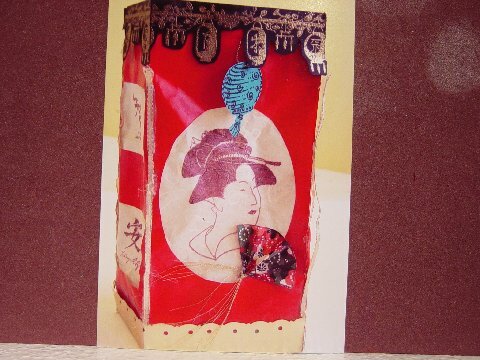 This I attached it on the geisha image on the front. The bottom gold border is a long strip of gold metallic paper which I cut with decorative scissors and punched a small hole under each scallop. I attached gold metallic thread vertically on each corner to bring the borders together. This was a fun project to make and it challenged me to really think outside of the box (or bag, as in this case)! Although I haven’t tried it yet, I think a tea light would be perfect inside! Thank you, Kay, for sharing your profile with us…and this ever so clever project!!! Congratulations and enjoy your month in the limelight!!! congratulations, Kay. Most interesting bio information. Great project. Thanks for sharing your talent with OSA. Congrats my MN friend, I can say Kay and I have met also, she belongs to our MnStamping group in Minnesota…………Talented stamper, glad to see you are SAM for May! Congratulations from me toooo Kay. I like your Coffee-bean-bag idea very much. a big congrats from downunder Kay, on being Sam for OSA well done! Many congratulations Kay! I loved reading your bio and cn tell that you like to have fun! This is brought out n your super inspirational project too! Great idea! Enjoy your month as SAM! Congratulations, Kay. WAY TO GO with your project; I love it. A similar project could be created for a gift container. Lots of possibilities mirroring your project. Big congrats, Kay! 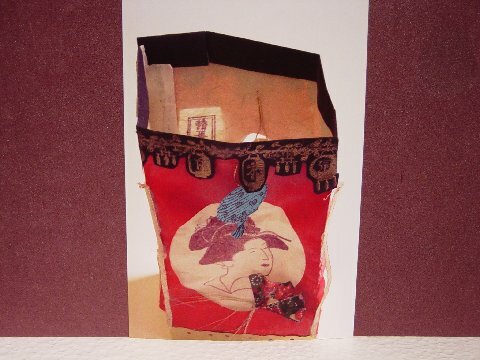 Your coffee bag project is awesome…such creativity. A wonderful BIO. You rock! Congrats to you Kay- a very interesting bio too! How cool is this awesome project- and I love that you showed so many details!